March 2016 – We are very sad to announce the passing of our long standing Patron Caragh Hanning, Caragh was an avid supporter of RAPID and its work around the world as was her husband Hugh Hanning. Caragh will be sadly missed and our thoughts are very much with her family at this sad time. 05 January 2016 – All at RAPID send their condolences for the passing of Willie McMartin MBE to his family and all members of the International Rescue Corps. Several of our members have deployed during the 80s and 90s with Willie to disasters around the world. Our thoughts are with you all. 27 October 2015 – Following a powerful earthquake that has affected the northern regions of Pakistan rescue teams from Chitral and Gilgit trained by RAPID are carrying out rescue work in the hardest hit areas. 14 June 2015 – RAPID would like to thank RAPID Racking, ARM Sanyo, The Lady Sue Ryder Fellowship and the MOC for their support. 29 April 2015 – Oman national team deployed to Nepal this team was also trained by RAPID. 27 April 2015 – Person rescued by RAPID sister team GEA who are a Turkish team trained by RAPID and able to respond quickly. 26 April 2015 – RAPID personnel deployed to Nepal in support of the government response. 26 April 2015 – RAPID personnel deployed for training in Lebanon. 25 April 2015 – RAPID closely monitoring the Nepal Earthquake and are ready to help in any way updates will be posted. November 2014 – RAPID-International invited to Emergency Planning conference in Ecuador. July 2014 – Three members of RAPID-International have deployed to Ghana with the donated 4×4 ambulance and medical equipment to provide training to local communities in the north. A report will be placed on the site on their return. We would like to thank everyone who has supported this project. May 2014 – Members of RAPID International are deploying to the Middle East to carry out further training. 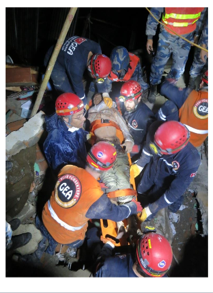 April 2014 – Members of the Peruvian rescue team trained by RAPID-UK deployed recently in support of the Chile rescue teams following a series of powerful earthquakes. Once again this proves that training indigenous teams will provide a quicker response. March 2014 – RAPID-International have received an official request for further support in Peru looking at three key areas, search and rescue training, fire/medical support and training and setting up community projects through the University. March 2014 – RAPID-International have been asked to locate a Fire Appliance for use in Damascus Syria, efforts are under way to secure the appropriate vehicle and equip the same. February 2014 – RAPID-International members have been giving support during the recent serious floods that have affected large parts of the UK. December 2013 – RAPID-International members have been supporting the relief effort following the Philippines Typhoon.